I figured I would check in with everyone, send a little proof of life your way, and tell you that in addition to surviving the four-day weekend of chocolate and Daddy duty, I've also been completely hooked on a couple albums which are totally not new releases but totally worth mentioning. I also feel a little bad for pulling the "listening" section out of the sidebar, so here's a little something for those of you who noticed. 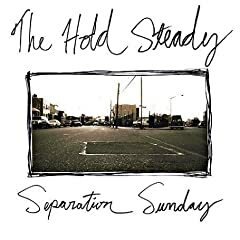 The first is The Hold Steady's Separation Sunday album. Introduced to me by brianna with their newer album, I picked this one out in a fury of back-stalking*, and was wonderfully impressed by this concept album which takes the listener quite consciously through a wild and colourful story of drugs, homelessness, and religion. What most impressed me was the lyrical and vocal genius of Craig Finn, who manages to spit out far more syllables than should be allowed in one bar, causing the listener to wonder just how he manages to make it through a song without dropping a line or passing out, completely anoxic. Their Boys and Girls in America album is also great (a favourite of my friend Erik, who has no blog. I know...wtf, right? ), in case that's the only one you can find. Be warned: this is no-off-the shelf rock and roll. 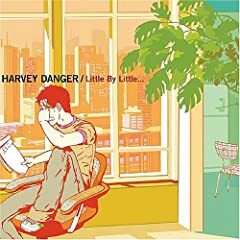 My second offering is the free-to-download Little by Little, by Harvey Danger. Anyone who knows the tune "Flagpole Sitta" (or this fab lip dub) already knows the creative lyrics and catchy tunes of Harvey Danger, but I'm here to tell you that Little by Little, their follow up release, does not disappoint. I heard "Little Round Mirrors" on Californication during the first season, and perhaps it was just perfect episode placement, but I was moved when I heard it, and I can't stop listening to it now, some six months later. It's that good, people. The second track, Cream and Bastards Rise, is also terribly infectious, as are the multi-line lyrical constructions in "Happiness Writes White". Excellent stuff. So there you have it. I'm still here, and you've got two perhaps-new-to-you bands to check out. You're ...uh, welcome? *Backstalking, n. The process of searching for all musical evidence from an artist in hopes that whatever it is you're hooked on has been duplicated with the same magnificence at another point in time.